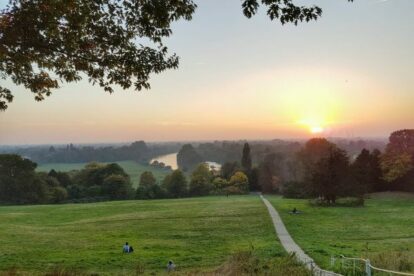 If I could choose one place for sunset-gazing in London, it would have to be perched atop Richmond Hill. The suburban district of Richmond is only a 20-minute train ride from London Waterloo, and a trip over is worth it for the view alone. The elevated spot offers prime conditions to watch the golden sun melting dreamily into the famous curve of the River Thames and locals and visitors alike flock over once it starts to darken. The river is framed with plenty of luscious greenery – even during the winter – and the majestic and fairy-tale like Petersham Hotel can be seen peeking out grandly from the foliage. Often, I have spotted resident artists standing with their easels and paint pots, totally captivated with the view. Grab a sun downer from the local’s favourite The Roebuck pub and sit back and enjoy. Afterwards, why not have a gander down to Richmond’s stone-cobbled centre and stop by one of the many restaurants for a bite to eat – I recommend Chez Lindsay or Pizzeria Rustica.